An apple that's outstanding in so many ways! Crisp and fresh with a perfect balance of sweet and tangy flavours, harvest early to mid September and eat immediately or store until Christmas. A different eating experience! 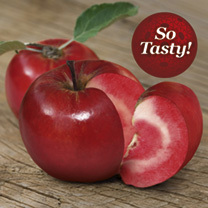 The world's first fine-tasting and scab-resistant red-fleshed apple, Redlove®. Uniquely coloured - Rosy-red flesh with a beautiful pattern running through it. Deliciously tasty - Crisp and juicy with a hint of berries. Even better for you - Higher in antioxidants than other apples. Disease resistant - Exceptionally high resistance to scab. Attractive in the garden - Unusual, long-lasting, deep pink spring blossom. Versatile in the kitchen - Delicious eaten raw but also ideal for cooking. It started twenty years ago with one man's dream and now Markus Kobelt has turned it into a reality. Taking sweet and firm, disease resistant apple 'parents', with years of meticulous cross pollination and selection, he has created this uniqe and exquisite tasting red-fleshed variety that will thrive in the UK climate! Redlove® boasts long-lasting and unusual deep pink blossom, and unique fruit that is dark red, both outside and inside, revealing a beautiful pattern when you slice through it. The juicy, fragrant flesh has a texture that can be likened to a Cox, but with an extra range of subtle cherry fruit flavours. A delicious eater, it is also ideal for cooking (it retains its red colour). Try it in fruit salads (it doesn't turn brown), pies, puddings and tarts. Or simply enjoy a glass of mouth-watering freshly squeezed juice! Though not self-fertile, it's easily pollinated by other apple trees, even up to 300m away. Redlove® is a protected trademark belonging to Lubera AG, Switzerland. The Redlove variety that we offer is protected and buyers of the trees are allowed to grow the trees for their private use. Buyers are not allowed to use the trees for commercial purposes (ie to grow for the fruit market or to multiply these trees or to sell fruit of the Redlove varieties under the Redlove trademark nor under another name).